There is more than one way to build with VEX IQ! See below for more information on how to download CAD Files, learn to CAD, or make your own parts! CAD is available as a free download for every VEX IQ part. These files are in the universal STEP format, compatible with SolidWorks, Autodesk Inventor, and most other CAD software packages. Design your robot virtually before actually building it! SnapCAD is a community-built solution for designing virtual VEX IQ models and creating printable, shareable instructions for them. 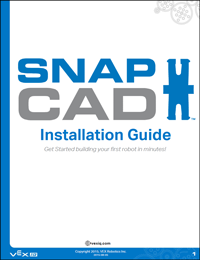 Use SnapCAD to test out a novel idea in the virtual world before building it physically, or to share your creations with the world in the form of step-by-step build instructions! 3D printing technology allows computer models to be quickly turned into real world prototypes. We are excited to support the VEX community’s desire to customizecustomise and extend their VEX IQ experience through the use of custom 3D printed elements. CAD is available as a free download for every VEX IQ part. These files are in the universal STEP format, compatible with SolidWorks, Autodesk Inventor, and most other CAD software packages. Users can download files in individual packs by part type or as one large ZIP file. Disclaimer: VEX IQ CAD models and 3D printing specifications are made freely available for personal and educational use. Commercial use of 3D printed VEX IQ parts is strictly prohibited. Using custom components on a VEX IQ robot design has the potential to cause unexpected behavior for which VEX Robotics is not responsible. Parts created using 3D printing technology are not eligible for use in the VEX IQ Challenge. SnapCAD is a FREE download and available to anyone with a PC running Windows 95 or newer (see below for full system requirements). Students can even install it on their home computers and bring their models (saved in the lightweight .ldr or .mpd file formats) into class the next day. Click here to download and install SnapCAD for FREE!! For help with downloading, use the Installation Guide below! For additional support using SnapCAD, please visit the VEX IQ Forum! Check out the SnapCAD repository to download models and Build Instructions for some amazing community designed creations! Make your own VEX IQ compatible parts, like a custom cell phone stand, using your 3D printer! Engineers and designers at VEX Robotics often use 3D printing technology to prototype, test, refine, and iterate our products before they are released. 3D printing technology allows computer models to be quickly turned into real world prototypes. We are excited to support our community’s desire to customizecustomise and extend the VEX IQ experience through the use of custom 3D printed elements. To ensure a positive 3D printing experience, we’ve compiled a few useful tips that will help your 3D printed parts correctly interface with the VEX IQ system. Use this specification drawing to understand the critical dimensions of the VEX IQ system. All VEX IQ parts use the same 12.70 mm (1/2 in) spacing and 3.18 mm (1/8 in) square shaft as VEX EDR. 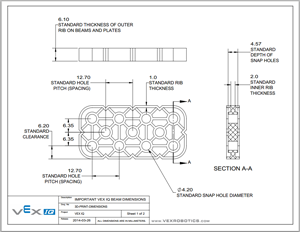 The specification drawing (PDF) to the left shows the important dimensions to take into account for beams, holes, and parts that interface with shafts. Keep in mind that there is a large variety of 3D printer types, materials, and precision levels, and you may need to tweak the parameters of your particular 3D printer to have your personalizedpersonalised part achieve a proper fit with the VEX IQ system. If your 3D printer is not capable of printing in high resolution, it may be helpful to print the 4.2mm holes slightly smaller and use a 4.2mm drill bit to clean them out. 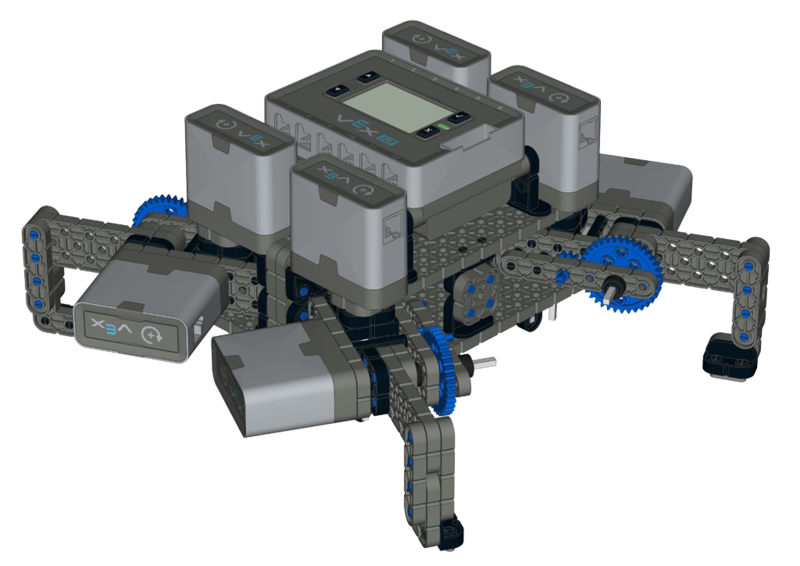 To help get you started, 3D CAD models of all VEX IQ elements are available for download above. All 3D printers function slightly differently, so don't forget to do plenty of test prints! We highly recommend that you avoid 3D printing any parts that contain snap geometry, such as connector pins, standoffs, and corner connectors. 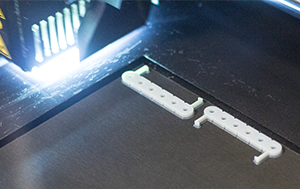 It is very difficult to reproduce a snap geometry via 3D printing that achieves both the necessary precision to have a snug connection while still remaining durable enough not to break on its first or second use. 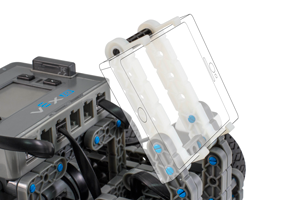 We suggest that all 3D printed VEX IQ compatible parts should be designed with only holes, to be mounted using existing VEX IQ connector pins, standoffs, and/or corner connectors. As always, be sure to follow all guidelines and procedures for your specific 3D printer model. Do you have any questions about using a specific model of 3D printer? Did you create a cool VEX IQ compatible element? Looking for fun ideas for potential parts to make on your 3D printer? Let the community know through the VEX IQ Forum! VEX IQ CAD models and 3D printing specifications are made freely available for personal and educational use. Commercial use of 3D printed VEX IQ parts is strictly prohibited. Using custom components on a VEX IQ robot design has the potential to cause unexpected behavior for which VEX Robotics is not responsible. Parts created using 3D printing technology are not eligible for use in the VEX IQ Challenge.